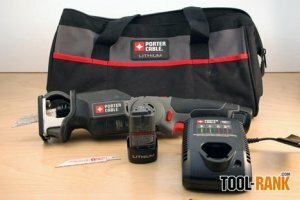 Porter-Cable first announced their ultra compact line of 12-volt tools back in August of 2010. They were one of the last of the major brands to make tools in the ultra compact category, but they had a few extra features that set them apart, as well as a lower price. One tool in the new line that caught my eye was their version of the ultra compact reciprocating saw; it had a new simple clamping feature that looked like could really come in handy. Porter-Cable was awesome enough to send their ClampSaw to me for review, and I have been testing it out for the last few weeks. The Porter-Cable 12-volt ClampSaw comes with everything you need right out of the box, which means you can be using the saw in no time at all. The PCL120CRC-2 kit includes the saw, (2) 12-volt lithium-ion batteries, a 30-minute charger, (1) 4" metal blade, (1) 4" wood blade, an hex wrench, and a soft-sided tool bag. When I first set eyes on this new saw, it was the clamping feature that drew me in. Anyone who has used a reciprocating saw has run into problems with the blade getting caught in the material, which causes the saw to jerk around. It is when we lose control when accidents happen. The clamping feature of the saw aims to solve these gripping and slipping problems. The clamping shoe is always on the saw and is tucked out of the way when you don't need it. When you are ready to get your clamp on, you can slide out the clamp and lock it into position with the included hex wrench. The top of the clamp even has measurements so you know how far to open it, depending on your material size. It opens up to a total of 2 inches, so you can fit all the common plumbing pipe sizes, and even a 2x4. The clamping feature works great, but it could be better. While the clamp itself is fine, the problem lies within the adjustment. The saw uses a simple screw to lock clamp into place. Any time you need to adjust the clamp, you are required to pull out the allen wrench, loosen the screw, adjust the clamp, tighten the screw, than put away the wrench. Porter-Cable has designed the tool with on on-board wrench holder, which helps, but is still a hassle. This is not only a convenience issue, but also there is the chance you might lose the hex wrench. To be honest, because of all of the wrenches floating around my shed, I am not even sure I am using the one that came with the tool. The ideal solution would be some type of quick release lever for clamp adjusting. The other selling feature if the ClampSaw is its pivoting handle. This feature allows the handle to lock into 3 positions: one position puts the handle at 90 degrees, one at 45 degrees, and the last has the tool completely straight. Each position is useful depending on the height of the material compared to your body. For anything around waist height, you would be comfortable with the tool straight. Anything higher would be more comfortable with the handle at 45 degrees or even 90 degrees if you are cutting over head. To adjust the handle you will need to slide a little button to unlock the handle, then it can be adjusted. It wasn't long before I was doing the adjusting just using one hand. At 90 degrees the saw is 14-inches in length; at 45 degrees it is about 10-inches long and 10 inches high. The tool itself is a bit front heavy, but this was actually a good thing. You can use the weight of the tool to help with the cutting. When cutting PVC pipe, the weight of the saw was all that was needed to make a cut. Another feature of the saw is the safety trigger lock. Normally I am against trigger safety locks because they are annoying, but the one on the ClampSaw was done well. It uses a simple one time lock on or lock off design. There is no need to hit a safety switch every time you pull the trigger. The trigger handle fits my hand well, with both the safety lock and the pivot switches within easy reach. However, if you are going to two handed way, the second hand will not be as comfortable. There was no optimum place I found I could put my other hand. I settled on just using it to provide extra downward pressure. Battery life on cordless saws is never as good as cordless drills, no matter how many volts, and the ClampSaw is no exception. You should have no problem alternating between the two batteries and having enough juice when you are cutting through lighter materials like PVC or Copper. The Porter-Cable ClampSaw is not intended to be a replacement for a corded reciprocating saw, so we knew what was to be expected. While I was only able to make a total of four cuts through some really hard stainless steel closet pole on a full charge, I was able to make over 50 cuts through 1/2" schedule 40 PVC pipe before I ran out of pipe. I could have probably done another 30-50 cut before I would have needed a recharge. If you are going to be cutting a bulk of material, your best bet is to get out a corded saw. The ClampSaw is a tool for people that need to do light duty cutting while on the go. If you stick to this, the saw is a winner. Overall the saw performed very well, and met all of my expectations. The clamping feature is by far the best design feature of the saw, and if I could have it my way, it would be implemented on full sized reciprocating saws as well. I would still want them to work out a tool-less way to adjust the clamping shoe though. The build quality feels top notch, and I was able to make more then 50 cuts in a row with becoming only slightly warm. The only thing that bothered me, besides the mentioned required hex wrench, would be the tool-free blade collar. The collar is a little hard to access because it is surrounded by the tools foot and clamp. Porter-Cable is supposed to be positioned below DeWalt and their contractor grade tools, but I would feel fine taking this to the jobsite. The ClampSaw is priced around $130, which is a good deal considering it comes with the two batteries.